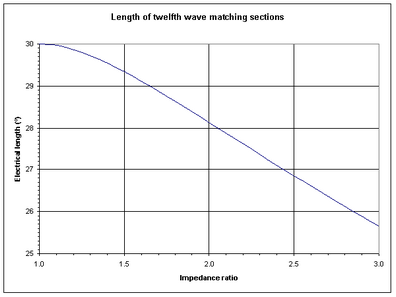 The twelfth wave transformer is a narrow band (ie tuned) impedance transformer. It provides a sometimes convenient means of transforming from Z1 to Z2 when transmission lines with Zo=Z1 and Z2 are readily available. For example, to transform a 75Ω load to 50Ω, it is a series cascade of a section each of 50Ω line and 75Ω line of length nominally 30° (or λ/12) each between the 75Ω load and 50Ω line (and vice-versa). It is a series cascade of a section each of 75Ω line and 50Ω line of length nominally 30° each between the 50Ω load and 75Ω line (and vice-versa). The exact length of the sections depends on the impedance transformation ratio, as shown in the figure above. Another simple example is to match two 50Ω antennas in parallel to a 50Ω main feedline. In this case, it is a series cascade of a sections of 50Ω line and two parallel 5oΩ lines of length nominally 30° (or λ/12) each between the 25Ω load and 50Ω line. It is a series cascade of a section each of 50Ω line and 25Ω line of length nominally 30° each between the 25Ω load and 50Ω line.